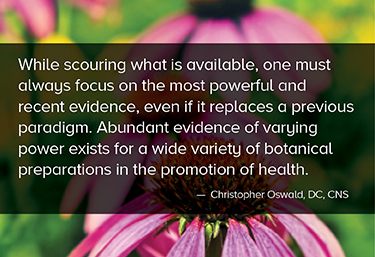 Botanicals and herbs are consistently used with the goal of supporting a wide variety of health processes. The use of botanical supplements is broadly reported throughout history in the application of numerous folk and natural remedies, with the oldest evidence pointing to use approximately 5,000 years ago. This evidence, many times, reports the use of similar plants with the same intended effects in cultures which would have no ability to share their knowledge.1 It is a challenge to base the decision-making process entirely on historical use, expert opinion, and anecdotal evidence, especially with the continued publication of newer, more powerful evidence, while still ensuring the highest levels of safety and effectiveness. Botanical products come in a variety of preparations including teas, tinctures, or extracts with separate portions of the plant (root, leaves, stem, flowers, or fruit) commonly found. This variability of application is important when looking for evidence to support use. Verifying that the form and portion of the plant being used matches what is referenced in the evidence is one of the first steps to ensure best outcomes. A large body of the evidence supporting the use of botanicals is based on tradition passed through generations, expert opinion, and anecdotal evidence. While this level of evidence provides a sound foundation, it is important to seek out the highest power evidence to support an intended use. As evidence is collected it is important to vet the quality of your evidence to ensure recommendations will yield the intended results with a high level of safety. While not every study will provide all of the above points the power of the total collection of evidence continues to grow with time. It is important to verify that the botanical or herbal preparation you choose has some level of support in the documented evidence. Future research would benefit all if it focused on specific standardized doses, specific time lengths, frequency of dosage, specific portion of the botanical used, and in combination with other commonly used herbs or botanicals. As the catalog of research and evidence grows, it is important to remember that higher levels of evidence (more recent, more powerful) must replace previous lower levels. As the scientific understanding of botanical use increases, the application in the maintenance of health must follow suit. 1. Petrovska BB. Historical review of medicinal plants’ usage. Pharmacognosy Reviews. 2012;6(11):1-5. 6. Pérez-Rubio K, González-Ortiz M, Martínez-Abundis E, Robles-Cervantes J, Espinel-Bermúdez M. Effect of berberine administration on metabolic syndrome, insulin sensitivity, and insulin secretion. Metabolic syndrome and related disorders. 2013;11(5):366–9. 7. Yin J, Xing H, Ye J. Efficacy of berberine in patients with type 2 diabetes mellitus. Metabolism: clinical and experimental. 2008;57(5):712–7. 8. Hu Y, Ehli E, Kittelsrud J, et al. Lipid-lowering effect of berberine in human subjects and rats. Phytomedicine: 2012;19(10):861–7. 9. Ardjomand-Woelkart K, Bauer R. Review and assessment of medicinal safety data of orally used Echinacea preparations. Planta medica. 2015;82:17–31. 10. Schapowal A, Klein P, Johnston S. Echinacea reduces the risk of recurrent respiratory tract infections and complications: A meta-analysis of randomized controlled trials. Advances in therapy. 2015;32(3):187–200. 11. Kasper S, Gastpar M, Müller W, et al. Lavender oil preparation Silexan is effective in generalized anxiety disorder--a randomized, double-blind comparison to placebo and paroxetine. The International Journal of Neuropsychopharmacology. 2014;17(6):859–69. 12. Kasper S, Anghelescu I, Dienel A. Efficacy of orally administered Silexan in patients with anxiety-related restlessness and disturbed sleep--a randomized, placebo-controlled trial. European Neuropsychopharmacology 2015;25(11):1960–7. 13. Al-Karawi D, Mamoori A, Tayyar Y. The role of Curcumin administration in patients with Major Depressive disorder: Mini Meta-Analysis of clinical trials. Phytotherapy Research. 2015;30(2):175–83. 14. Ghorbani Z, Hekmatdoost A, Mirmiran P. Anti-Hyperglycemic and insulin Sensitizer effects of Turmeric and its principle constituent Curcumin. International Journal of Endocrinology and Metabolism. 2014;12(4).